These pants are my current obsession. Aren't they cute?! From afar, they look like polka dots, but up close, they're apples! Jean and I unknowingly bought the same pair and both wore them on the same day. What can I say, great minds think alike. I'm wearing kids size 14 with minor alterations around the ankles. If you're curious about the fit, you can read Jean's review here. One of my favorite outfits on you, Khatu!!! The pants fit you perfectly. Did you slim down the openings? @Vicky thank you, Vicky! And yes, I did minor alterations to the opening. What size are you normally in JCrew Women's. I typically wear a 0 in the womens cafe capri - however now that they've adjusted their sizing I don't know if that holds true. Based on size chart I think I would be a 14 too. Thoughts? Your white Chanel is amazing! You and Jean rock those apple print pant. Thank you for your sweet comment on our site! We love your style, the combination here is just lovely. Maybe we can follow each other is you want? you two are so cute!! and both of you paired the pants totally differently. love how classy you make kids apple pants look, lol. This is totally adorable...loving the mix of prints! Love this red, white, and blue combo. So pretty! The apple printed jeans are too cute. I did a double take when I saw your pants. Polka dots! No, apples! So cute! I love that you mixed them with another pattern and bright color. you look adorable! the pants are so cute! i love that you can wear children's clothing. biatch! ps. i am hosting an amazing pop up restaurant giveaway for next week in boston somewhere secret! I LOVE your print-mixing! Super cute. I recently discovered on your blog & i'm hooked! I love pairing Navy with a tangerine orange! I saw these pants on Jean's Extra Petite blog too! Kinda made me wish I could fit in kid sizes! They're so cute on you! Could you look any cuter in those pants??! 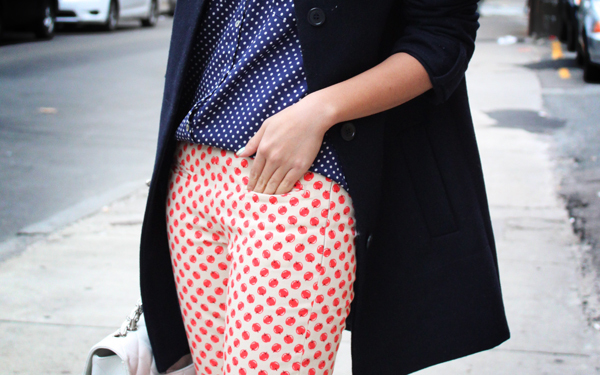 Love the pattern pairing! Love your pants! Your hair is beautiful too! What do you think about annie from really petite always copying petite bloggers style? especially your friend jean's style. I love the apple pants! oh haha literally apple bottoms. Such a cute print! following your lovely blog! Cute title, even cuter pants. i love ur style! i'll follow u! @Anonymous Actually Raf, you are wrong, persimmons is the COLOR. In case you can't read, the full description is "Girls' side-zip café capri in APPLE bobbing."